It’s been great fun working with JavaFX 2.0. But before the release of Calendar Component in JavaFX I tried to create my own custom calendar component and to an extent I am succeeded in creating it. Before going in detail about the calendar, I would like to inform you all that I had referred the EXTJS Calendar for the design reference. I tried to impose all the features that are present in that calendar. The complete source code download you can find here. [Download] or at the bottom of the post. 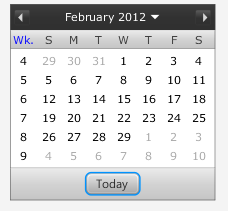 The calendar component mainly contains two panes. On clicking the down arrow in the base pane, the top pane is displayed. 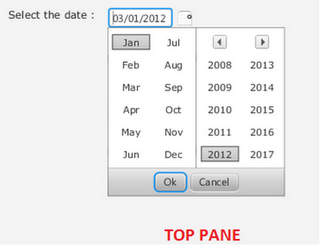 Desired month and year can be selected and upon clicking the "Ok" button, the month is displayed in the base pane. Let’s dig deep into the component source code. Button/Image - to trigger the date picker pop up. FXCalendar class also contains few setter/getter methods which enable us to customize the calendar to a further extend. I will discuss about those methods later in the post. As the code for the classes are a bit large, I will just focus on the core part in the classes. // Handling only when focus is out. clear(); // TODO : Error styling for invalid date format. The DatePicker class is resided in the PopUp control, and is the place where the BasePane and TopPane’s are instantiated. 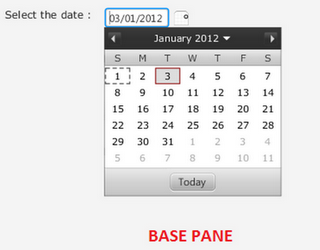 DatePicker is a stackpane which holds the TopPane and BasePane in it and toggles there visibility based on the controls. The code for the DatePicker is as below. The another important file required for implementing the FXCalendar controll is importing its related stylesheet file. The look and feel of the calendar can further be customized by changing the code of the calendar_styles.css file. Once the java package of eight files is imported and the style sheet (calendar_styles.css) is loaded to the scene, we are all set to use the calendar and play with it. The fxcalendar can be initiated as below. As the FXCalendar is a customised HBox (as it extends HBox), it can be used just like a normal node and can be placed anywhere in the scene. The values (java.util.Date) can be set or get using the following methods. The calendar can be made locale specific or can change its Locale dynamially by setting the corresponding java.util.Locale to the below method. Updates: Based on the comments of PhiLho, the week display implementation for Locale specific is modified. For example, for FRENCH locale the week starts with Monday, likewise for UK, ITALY, etc. The FRENCH locale specific calendar is shown as below. The calendar can be set to show/off the display of the week numbers by the following method. By default it is set to false. The week numbers are displayed in the calendar as below. The calendar theme can be set to suite to your application. The theme can be set by the following method. Note: Please make a note that it would be better if the base color is dark color, as the skin goes lighter from the base color. The new theme of the calendar is displayed as below. I hope this component can be helpful, to fill the gap till the actual JavaFX Calendar component is released.